However, you’re a true movie buff if you successfully put two and two together to understand why these iconic movie seats were necessary in a place like Winterset, Iowa. The answer – Academy-award winning actor John Wayne was born in a tiny four-room house in Winterset on May 26, 1907. However, the birth certificate on file in the historic Madison County Courthouse identifies him as Marion Morrison. If you knew that, you are indeed a movie trivia junkie. 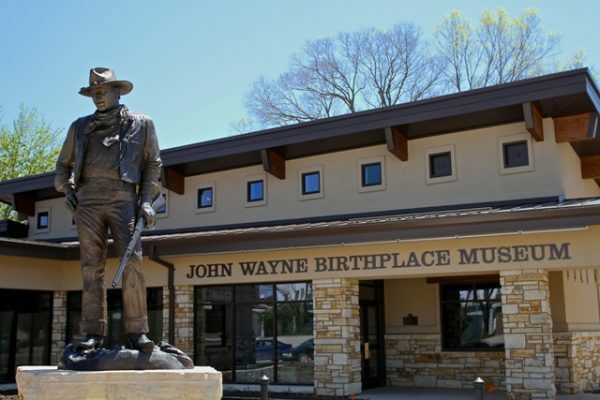 To celebrate his birthday in 2015, John Wayne’s children, his good friend Maureen O’Hara and thousands of fans from around the world cut the ribbon on the long-awaited John Wayne Birthplace Museum in Winterset, located within 100 feet of the home in which he was born. 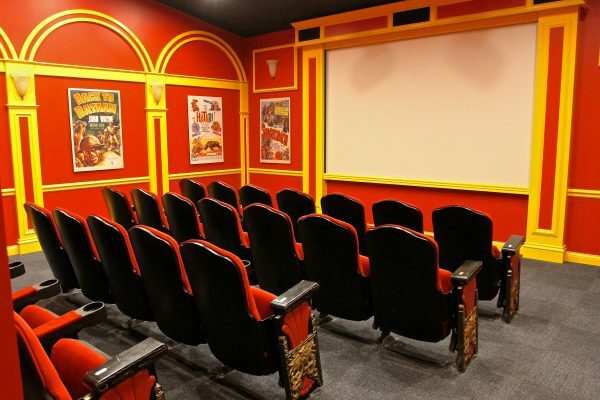 Recognized as the largest collection of John Wayne artifacts available to the public, the birthplace museum has a small theatre that shows highlights of many of The Duke’s movies, and that’s where those seats from Grauman’s Theatre now reside. Of course, John Wayne’s handprints are among those in the sidewalk in front of Grauman’s and many of his movies premiered at the theatre. There are no handprints in Winterset, but a couple of bigger-than-life bronze statues make for great selfies of fans and the big man. A timeline of his life covers 25 events from his birth in Winterset to the family movie to California in 1914, his college football career and highlights from his personal life, including three marriages and four children. 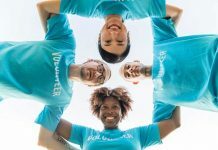 Among those personal artifacts are a dirty, rumpled fishing hat, life vests from his yacht, the Wild Goose, and monogrammed luggage tossed in the trash by his third wife, Pilar, but rescued and donated by daughter Aissa, who serves on the museum board. However, much of the 6,100 square foot museum is devoted to his film career, including the rifle he used in “The Alamo” (1960), the saddle he rode in “The Cowboys” (1972), and the toupee worn in “Chisum” (1970). Yep, John Wayne wore a toupee. Set pieces from “The Shootist” (1976) dominate the gallery and a bloody shirt, also from “The Shootist,” represent the last scene of the last movie he ever made.